We have a "bottleneck" in our pedigrees dating back to Ch. Inchidony Prince Charming from the early 60's. Note: a common thread: Most dogs that develop epilepsy have a sire, dam, grandam or grandsire who have produced epilepsy or have had siblings that have seized. MOST of them. Some have been fortunate for it to have not shown up in their lines, yet. if someone says something unkind about me, I must live my life so that no one will believe it. This years National Specialty held great promise for my English Springer Spaniel, Ch. Pawmarc's City Lights (Keifer). 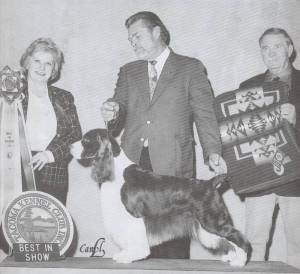 He had risen to the position as number one dog in his breed and number five Sporting dog, and naturally I was very proud to be his breeder and owner. I had dreamed of this moment, of having the dog other breeders and fellow exhibitors looked forward to seeing at the National. The grand finale was coming up, and my dogs career was sparkling. He had just won two, back to back, Best In Shows, the weekend before and everyone knew it. We left for the long three day trip across country on Monday, and by Tuesday the worst thing that had happened were the ants. Keifer lifted his leg on a plant full of ants, and they were everywhere in his coat. They wouldn't comb out, nor would they pull out, so I picked them out one at a time. Barely leaving the hotel by check-out time, we traveled on, looking forward to our destination. By evening, the most tragic day of my life began, Keifer began having seizures in his kennel...one after another, after another, after another. I was terrified and panic stricken as waves of nausea hit me. I watched my beloved dog go from a normal, healthy, happy dog to a dog I knew might die a horrible death. Limp and lifeless after each seizure and crying before the next, he was rushed to an emergency vet, where we spent the next three days with Keifer, without any success in stopping the horrible ravages to his body. I was so distraught and devastated at that point that I could not talk to any of my friends who were expecting me at the end of our journey. I simple told one of them that we had car problems and couldn't get to the National. The excitement of which top dog was to win, the grand finale, was never to take place, and my friends were all beside themselves with worry over my car problems and wondering what had happened. I just shut myself off from the rest of the world at that point. We finally drove to the University of Iowa, where the neurologist eventually, after six long agonizing days, got the seizures under control. Her prognosis after doing a number of negative blood tests, checking for everything possible, was idiopathic epilepsy. Keifer has had yet another episode of cluster seizures, lasting five days this time. He has done so much for me that I will continue to do what I can for him to make the quality of his future life as comfortable as possible. I have come forward with this story in hopes that others in our fancy will the the same with theirs. I was terrified to tell the truth, because, quite frankly, there are a fair number of mean spirited people ready to destroy me as a breeder. How dare I have genetic problems in my lines!! To blame and accuse and delight in other people's sorrows are the most common ailments in our society. Obviously, these people never once stop to think it could happen to them. As careful as we try to be, no one deliberately sets out to breed a problem. We love our dogs and want to do right by them. Breeding responsibly is still, and always will be, a toss of the dice, for as long as we are breeding animals. It is my greatest hope that Keifer can help find a genetic marker for our breed. The University of Missouri and the parent club, the English Springer Spaniel Field Trial Association, has launched an all- out effort to remove this horrible disease from our Springers, and they are making progress. If we can honestly talk to each other openly, honestly, and without blame, only then can we make a difference in each of our breeds, to help rid them of genetic nightmares.